Preliminary research shows that a woman’s chances of getting pregnant can depend on how well she looks after her teeth and gums. 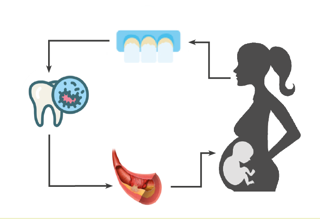 Researchers report that the effect of gum disease on conception is about the same order of magnitude as the effect of obesity, suggesting that gum disease might be one of several factors that could be better managed to improve the chances of a pregnancy. One particular study found that women with gum disease took on average two months longer to conceive than women without gum disease. Gum disease, also known as periodontal disease, is where the gums and supporting tissue are chronically infected and inflamed. Gum disease is more common than we think. About one in ten people are thought to have severe periodontal disease. Our mouths are full of bacteria, which stick to mucus and bits of food and form a sticky “plaque” on our teeth. Brushing and flossing gets rid of plaque, but if this is not done regularly and effectively, then the plaque becomes hard and turns into “tartar”. This is much harder to get rid of and needs professional attention to be removed properly. If the plaque and tartar are not removed the bacteria causes an inflammatory infection called “gingivitis”, where the gums may appear red and swollen, and bleed. If left untreated, the disease moves to a stage where the issue and bone that support your teeth are affected: this is called ‘periodontitis’. In periodontitis the gums pull away from the teeth and pockets develop that become infected. The bacteria and plaque starts to grow below the gum line, causing the immune system to respond. Toxins from the bacteria and immune system activity start to attack the tissue and bone that hold teeth in place, and they become loose, drift, rotate and look longer. Can gum diseases affect the rest of the body and increase the risk of other diseases and conditions? It is important to remember that these destructive toxins can also get into the bloodstream, which may explain why gum disease is linked to increased risk of a number of chronic diseases such as diabetes, respiratory and kidney disease.